Simon Ward is a Qualified Teacher of the Visually Impaired, working for Wirral Local Education Authority. Many of the visually impaired learners under Simon’s care are unable to read standard print, so ensuring that they have full and equal access to the curriculum is a challenge. As one of only 4 QTVIs in the authority, finding an app that improved students’ book access, which is fully accessible and free, was a real breakthrough. “I have 65 children on my caseload. 25 at special schools and 40 in mainstream. Approximately 50% of my time is spent in class providing teaching support directly with my learners. I work with 1 braillist who has fulltime 1-to-1 support and 5 children who are also registered severely sight impaired, all at their local school. We mainly use iPads and RNIB Bookshare to enable our VI learners to access the curriculum. We used to use their iPad to search and read in RNIB Bookshare. The children would have to open Safari, try and remember the login for RNIB Bookshare. And then search - and then download the book. They struggled with the complexity of this. With the younger children, we have to do all of that for them. We can adapt standard print and order large print copies of a book, but that always takes time, it takes away the spontaneity of choosing and picking up a book which their classmates can enjoy. Now we’ve downloaded the EasyReader app onto their iPads. It’s free and, with EasyReader, it is a very straightforward process. It’s really clear and simple for the children and EasyReader remembers their RNIB Bookshare login for them. They then just search for the book they’re looking for, say “geography revision”. Couple of buttons and it is there. And students can read and listen. 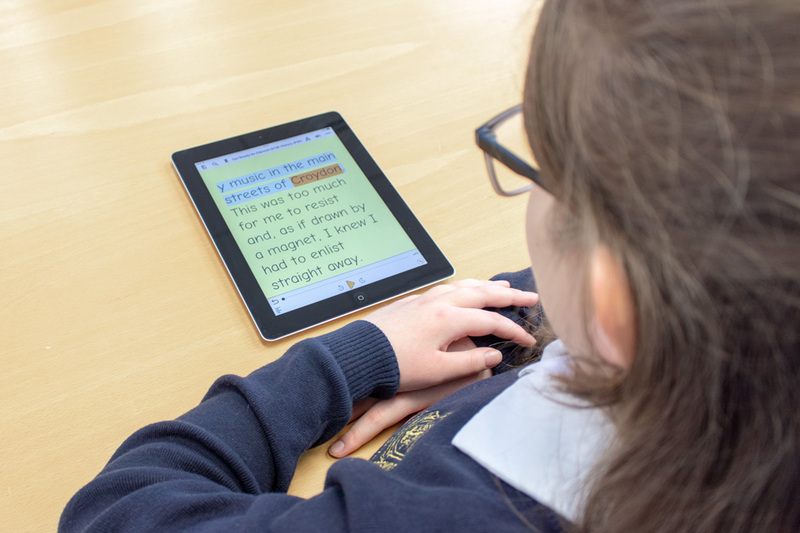 The clarity and size of the text within the app makes it fully accessible to low vision pupils. The scope for EasyReader is really impressive. It’s making our children so much more independent. I have one particularly bright boy in year 4, who’s a good example. Now he is reading for pleasure. He’s really got into Michael Morpurgo and before that it was Horrid Henry. He’s also a big sports fan, especially rugby. He uses EasyReader to search for biographies of sports personalities. EasyReader and RNIB Bookshare has opened up a whole range of books to him. He loves to share the information he finds with his peers. In class he will share his iPad with his friends and encourage them to “have a look at this” and “have a look that”.